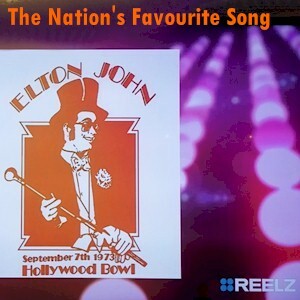 This unique and historically correct t-shirt artwork was featured on the REELZ TV special, "The Nation's Favourite Song". It is the "Real Deal". Upon receipt of your order, Moab Jim will donate $10 to the Elton John Aids Foundation. The Story: In late 2002, I dragged out my slowly deteriorating Elton John September 7, 1973 Hollywood Bowl concert t-shirt and assessed its sad condition. The silkscreen image of Elton was crumbling more with each washing. A spirit told me that I might have the last souvenir t-shirt from that magical night, so I decided to save it for posterity. After snapping a digital picture of the t-shirt, I began the laborious re-pixelation of that image. Over the course of several months, I spent at least 200 hours restoring my Elton image as close to the original as possible. The Elton John replica concert t-shirt is a MoabJim worldwide exclusive item, not currently found on TV or in any store. Be the first on your block to relive Elton's classic live concert in bright red style.